Immediate annuities are the first of the three major types of annuity investments. The immediate annuity is also called a single premium immediate annuity or SPIA. When you purchase an immediate annuity, you are entering into an agreement with an insurance company to purchase a guaranteed level of income on a predetermined schedule. Simply put an insurance company calculates the amount of monthly income it can provide to you based on the amount of your initial investment, the type of annuity you want (fixed, variable, or inflation-indexed), the term of the annuity you choose, and your gender and age (used to calculate your life expectancy). One of the biggest advantages of immediate annuities is that it provides you with an absolute guarantee of income. 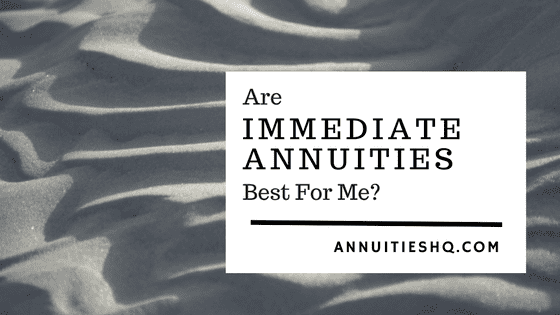 So for folks that are looking for a predictable, guaranteed level of income, for either a term certain annuity or a life plan annuity, an immediate annuity may be a good choice. An important factor to keep in mind, is that you cannot change your mind once you’ve entered into an immediate annuity contract with the insurance company. For example, you are two years into the immediate annuity you’ve purchased and have been receiving a steady stream of income on a monthly basis. For whatever reason, you change your mind and want the remainder of your lump sum investment back. Under most circumstances this is not possible.